Subway Surfers Help Jake, Tricky & Fresh escape from the grumpy Inspector and his dog! 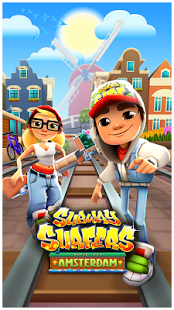 Subway Surfers is an endless runner that puts you in the role of a graffiti artist running from a subway inspector, collecting coins and avoiding obstacles along the way. The game itself is fairly simple. Taking most of its cues from Temple Run, you simply avoid all the obstacles you can while picking up coins. There's not much to the game beyond testing your reflexes, but it's a solid entry in an otherwise uninspiring genre. If you like endless runners, this will definitely be one of your favorites. If you don't, you won't find anything here to change your mind. The #1 App of all time turns 7! Be the ultimate bringer of sweet, tasty destruction with every slash! Welcome to Ant Smasher! Smash as many ants as you can and avoid the bees! The lovable cartoon duo Tom and Jerry are back in this cat and mouse frenzy!